We devote ourselves to perfection when it comes to taking care of our patients. Their satisfaction, smile and kind words are the best rewards a doctor can receive. 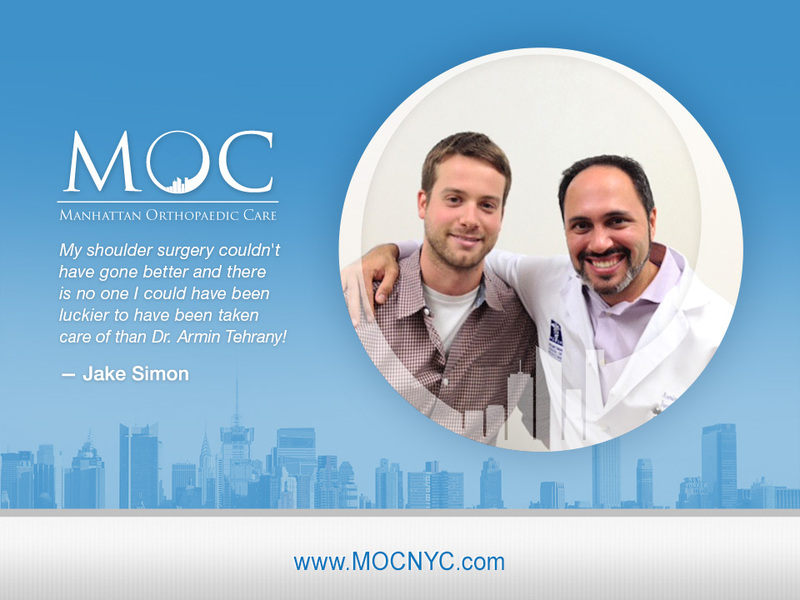 By sharing his experience with Dr. Armin Tehrany and the staff at Manhattan Orthopedic Care, Jake Simon proved that happiness in its purest form can be felt when taking good care of others. Jake Simon had shoulder surgery, that went as smooth and comfortable as possible. “Dr. Armin Tehrany and his co-workers genuinely made the whole surgical experience as comfortable and easy as it could possibly be, from the first consultation throughout rehabilitation. The facilities are state of the art and clean, and every single person who he works with, doctors and secretaries alike, are incredibly thorough and attentive. I am now 6 months out from my AC joint reconstruction and my shoulder is doing incredibly well – back to playing basketball and plan on returning to snowboarding this winter. My shoulder surgery couldn’t have gone better and there is no one I could have been luckier to have been taken care of than Dr. Armin Tehrany!”, Mr. Simon wrote in his patient testimonial.